Striped Skunks are mammals from the Weasel Family. They are black with two white stripes down the back that meet at the head, giving skunks a white cap. They have bushy black tails, usually tipped with white. The color patterns can vary. Striped Skunks have long claws on their front feet for digging. Males are larger than females, growing up to two and a half feet long. Striped Skunks are mostly nocturnal and are therefore very active at night. Skunks are well known for the way they defend themselves. They have a special gland in their butts that sprays a foul-smelling liquid. The liquid will cause great pain if it gets in an animal’s (or person’s) eyes and will temporarily blind. The spray is a type of oil, is very hard to get off and will smell bad for a long time. Skunks only spray as a last resort. 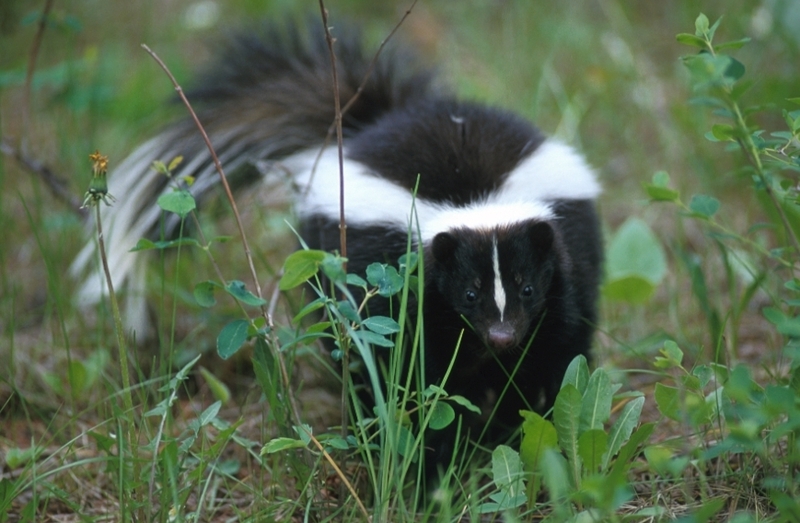 If threatened, a skunk will first face its attacker, arch its tail, chatter its teeth and stomp its feet. If the threat does not go away, then the skunk will turn around and spray.